I'm not out to discredit Starbucks. Honestly. But, after the deluge of interest in Monday's post, I have another Starbucks gem to share. 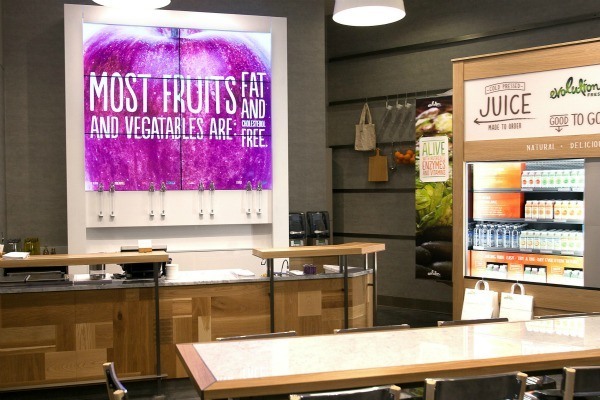 As reported by Time NewsFeed, the company opened its first Evolution Fresh outlet this week in Bellevue, Washington, USA. Oh dear. Massive fail I'm afraid. Is it a bad sign that a company specialising in fruit and veg can't spell vegetables properly? Well, it's certainly a bad sign. You never know, though. Perhaps they're talking about special tables in each branch that are positioned just below a skylight so customers get an excellent view of Vega, the fifth brightest star in the night sky? Haha. I'm willing to bet that no one else could have contrived such an explanation. Your imagination is far too vivid. It really is an awful sign. At first I read the message as Most fruits fat and and vegatables are free. And who's ever seen a purple apple?